I live a conflicted life – I yearn for sweet treats while simultaneously scrutinizing them for sugar content. Sugar is also the topic of this blog, albeit indirectly. As I studied my sugar intake I began to realize there is enormous amounts of it in some unexpected places, especially in breakfast foods. Everyone knows donuts are quite sugary, but when you turn a careful eye to other foods such as yogurts, and even many cereals, the sugar really comes out of the woodwork. 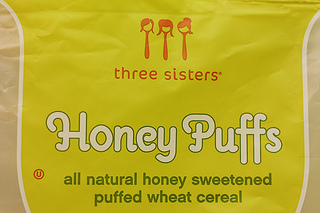 Our product this time is in that very category, a strongly sweetened breakfast cereal made by Three Sisters company (not to be confused with “Three Twins”, the ice cream producer). A great thing about this company is that they purchase wind-generated credits proportional to the electricity used to make their cereals, a nice aid to sustainable energy. 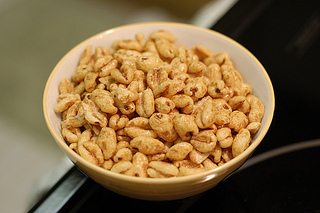 This cereal is made of sweetened wheat grains, puffed with heat in a process much like popcorn. Both flavor and composition is very similar to Post’s Super Golden Crisp, which it’s clearly modeled after. I think you probably already saw this coming, but the sweetness is a little too heavy for my taste, especially when eating this as my first meal of the day. The puffy texture is pleasant, but it seems a tad airier than Post’s classic cereal, at least as far as I can remember. If the overt sweetness doesn’t bother you, you will likely find this cereal quite delicious. My young son loves this and eats it up, sometimes asking for seconds. One serving (27 grams or ¾ cup) contains only 110 calories, a typical value for cereals. Unfortunately sugar clocks in at a whopping 15 grams. Sure, if you only have one serving this isn’t a massive amount, but the amount of sugar per weight is very high, surpassing many ice creams! With minor amounts of minerals, this product is nutritionally unimpressive, with only 2 grams of protein and zero fiber. There is low salt (65 mg), and no fat or cholesterol, but that doesn’t make up for the lack of nutrition. Sugar, Wheat, Corn Syrup, Honey, salt, Caramel Color, Soy Lechitin, Citric Acid, and Sodium Acetate. Three out of four of the top ingredients are used for sweetness. With a name like “Honey Puffs” you would expect honey to be the most prevalent, but instead its disappointingly last, and thereby in a much lower proportion that the other sweeteners. Corn Syrup, while not nearly as bad as its evil brother High Fructose Corn Syrup, is nevertheless made from processed corn and something I think we all have had too much of in our diets. Caramel Color is another undesirable item which I discussed in one of my recent posts. Effects on the body vary depending on the process used but coloring is never a plus unless its from something completely natural. Sodium Acetate is a common flavoring agent (it gives the characteristic taste to salt and vinegar chips), which supposedly has no major health drawbacks. Having said that, I prefer they would use something a bit more natural, like plain old salt. Above all my biggest problem with this cereal is that it isn’t much different than the classic cereal it is clearly based off, Post’s Super Golden Crisp. Ingredients are very similar, though there are some minor tradeoffs like less salt (40 mg) and non-zero fat (.5 g). To make matters worse, Honey Puffs actually has *more* sugar than Super Golden Crisp. Give me a break! I think making a healthy version of a not-so-healthy classic is a great idea, but I wish they would set themselves apart by a wider margin. Available exclusively from Whole Foods. I purchased mine for $3.99, though recently they had a sale for buy one get one free. Cereal with too much sugar and not enough nutrients to make a well-balanced breakfast. I recommend the Honey Oaties cereal from the same company, which contains more fiber and much less sugar. Posted on October 2, 2013, in Food and tagged breakfast, calories, caramel color, cereal, honey puffs, product review, puffed wheat, puffs, report, review, sugar, sweet, three sisters, Three Sisters Honey Puffs - Product Review, wind credits. Bookmark the permalink. 1 Comment.